Šibenik is a historic town in the central Dalmatia that is known for its white stone buildings including the Cathedral of St. James, also a UNESCO World Heritage site. The town sits at a midpoint between Split Riviera and Zadar in an inverted bay marking the mouth of the Krka River and the Adriatic Sea. Šibenik has a rich history including the four fortresses which date back up to 600 years and each offer their own tale of the town’s colourful past. The narrow streets, well-preserved walls and the buildings all tell the story of its history and is a town where you will truly feel like one of the locals. The Krka River flows through the city, where it enters Lake Prokljan and empties out into the sea. The Krka national park is famous for its idyllic scenery and mesmerising waterfalls, located only a short distance away from Šibenik and easily reached by bus. Šibenik is surrounded by St Anthony Channel and Lake Projljan which are both popular tourist attractions and also vastly contribute to the excellent fishing industry of the town which provides the restaurants with fresh fish daily which they expertly prepare. When visiting Šibenik you should also make sure to visit the small islands and attractions in the nearby areas. Whereas Šibenik is a village caught in time and its architecture heritage is a delight, you will want to venture to the surrounding villages and national parks to enjoy the Croatian wildlife and greenery. There is the manmade Jadrija seaside resort, which is located at the entrance of the St Anthony channel and great for all sea sports lovers, and the island of Zlarin which is famous for its red coral and stunning sunsets. As well as the beautiful Krka National Park there is the Kornati National Park or nautical paradise as it is referred to, which includes 89 islands that are a natural phenomenon of the sea and best seen by boat. Make sure to check out our full guide to Šibenik and the surrounding areas and view our vast range of luxury villas below, all handpicked to provide the ultimate villa holiday in Croatia. Although Šibenik was founded in the 9th century by Croats, traces of settlement date back to prehistoric times, more specifically in the Neolithic era when Danilo culture boomed. In the Iron Age, it was inhabited by the Illyrian tribe, who were excellent sailors and had control over the protected harbour in the Adriatic. In the 11th century, the city recognised the sovereignty of the Croatian-Hungarian kings, but it wasn’t until 1298 that it was established as a Croatian City under the Diocese of Šibenik. For the period of Venetian rule (1412th-1797th), Šibenik experiences an economic and cultural development as well as successfully defending themselves against the Ottoman Empire. Similar to history throughout Croatia, Šibenik then saw a number of rulers until the 20th century when the Croatian Republic was founded. During the Croatian War of Independence, Šibenik was heavily hit and many historical buildings damaged. However, it didn’t take long for this cultural city to recover and soon developed the city into the rich tourism hub that it is today. Like most Dalmatian cuisine, gastronomy in Šibenik is diverse and offers full flavours of the cultured nation. While the food is simply prepared, it is made with fresh and locally sourced ingredients that are full of flavour. With a location close to the beautiful blue sea, Šibenik offers a popular range of fish specialities including a fish stew full of shellfish, seafood risotto, grilled fresh fish and fish soup. One meat speciality of the area is peka which is a blend of meat, vegetables, herbs and olive oil that is baked for several hours under an iron dome or bell. Skadrin risotto is traditionally prepared over 12 hours so the meat, usually veal, falls apart and is loaded with cheese from Pag. Smoked ham from Drniš is popular due to the incredible quality and taste. The process of its production lasts 18 months and includes salted, pressing and drying with smoke. Cheese is essential if you choose to eat Dalmatian smoked ham. Especially Pag cheese which is a delicious cheese made from sheep’s milk that is hard and salty and a perfect compliment to ham. Soparnjak is a traditional pastry dish that is filled with a mixture of fig and olive oil, usually served cold. It is known to be found with a variation of fillings including onions, olives, parsley, as well as sweet options. No trip to Šibenik is complete without trying the wine from the Primošten vineyards, which is expertly prepared and matched to the rich cuisine. Dessert wines such as maraština sherry are popular as well as homemade brandy which is served with dried figs. The harbour is a popular destination for many tourists to the region with a wide range of restaurants enjoying spectacular views out over the bay. It is however suggested, that for those seeking a more traditional Croatian meal the old town will present a better location. When you come to Šibenik there is no need to book a guide to show you the historical sights, simply walk around the central city square to surround yourself with this city’s rich history. Šibenik is home to four fortresses; St Michael’s Fortress, Barone Fortress, St John’s Fortress and St Nicholas’ Fortress. 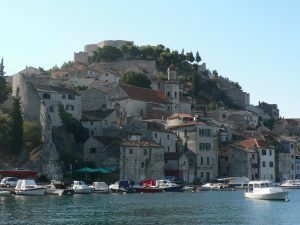 The fortress of St. Nicholas, St. John and Barone stand as a reminder of the smart defence that Šibenik took against the Turks in the 16th century. St Michael’s Fortress is the oldest in Šibenik, thought to have been built around the 11th century and casts an imposing figure over the city. Šibenik is a city that is full of religious buildings, museums and galleries but one very proud party of its history is the Prince’s Palace which is now known as the Šibenik Museum and houses many historic artefacts and original architecture. You’ll be amazed by the medieval Mediterranean garden in the monastery of St. Lawrence, the only one of its kind in Croatia. It is full of sweet smelling flowers and herbs with expertly designed landscape and is a true architectural delight which you must visit. If you are in Šibenik, then you have a unique chance to visit four national parks: Krka (16 km away from Šibenik)and Kornati Islands (15 nautical miles). Krka is the most famous and easiest to get to from Šibenik. It is home to 7 breathtaking waterfalls which you must see for yourself and swim in the calm waters beneath. Those who love sports and are after a more active holiday can bungee jump from Šibenik Bridge, climb and hike the beautiful surroundings, scuba dive in the clear underwater surroundings, cycle numerous bike paths, visit the water park or visit the Falconry Centre where you can learn all about various birds of prey. 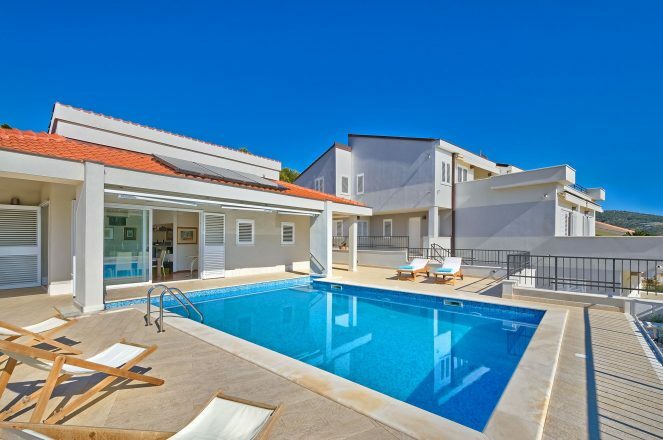 If Sibenik doesn’t have enough to offer you during your luxury villa holiday, Sibenik is very well connected to other areas of the Adriatic Coast. The Adriatic Highway connects the town to other coastal hotspots, while there are also excellent rail connections to neighbouring Split and Capital Zagreb. The highway will be your main route to and from the nearest airport in Split around 45km away.